The plans for a drone air-traffic control system may set the ground work for bigger things. It may be a year or more before the U.S. Federal Aviation Administration (FAA) changes its rules enough for Amazon or other hopefuls to deliver products by drones. But the five-year FAA Reauthorization Act of 2018, signed into law Oct. 5, confirmed controversial rules the FAA considers critical to its ability to regulate drone traffic and confirmed funding and plans for drone-specific additions that would create an air-traffic control system that can track traditional aircraft and a rapidly growing population of commercial unmanned aerial vehicles (UAV). The near-term goal is to provide safe, low-altitude operations for both drones and manned aircraft. The longer-term goal is to accommodate what is expected to be enormous growth in the use of commercial drones, in an efficient way, according to briefing materials from NASA. The bill covers all aspects of the FAA’s operations, but the biggest change is the integration of civilian unmanned aircraft into the national airspace system using a NASA-designed network of tracking systems called the unmanned aircraft systems traffic management (UTM) system. Most of the rules remain the same. Unless they have a commercial drone license that adheres to the FAA’s Section 107 requirements, drone pilots have to be flying for non-commercial reasons. They have to register their aircraft, fly only within visual line-of-sight, stay away from other aircraft, stay under 400 feet and avoid emergency response efforts. The UTM is not designed as a homogeneous, centralized repository of real-time information on the current status of drones. 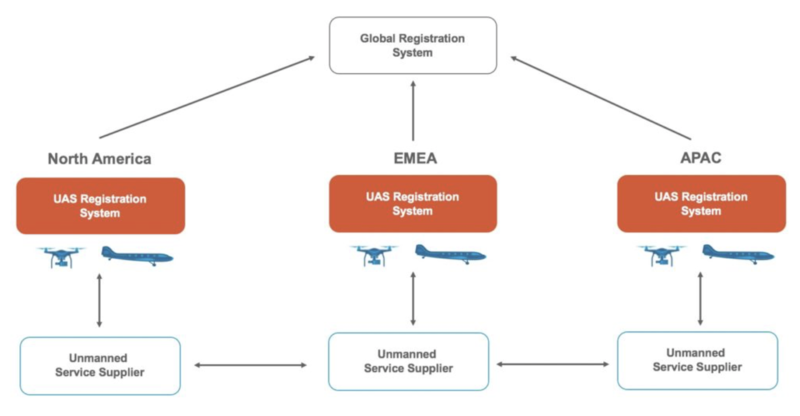 Instead it depends on local Low Altitude Authorization and Notification Capability (LAANC) applications designed to automate the process of authorizing drones to use local airspace and tracking their locations. LAANCs are operated by non-governmental UAS Service Suppliers, which will maintain the systems and make sure current data on the presence and activity of drones is shared through the UAS Data Exchange and represented on USA Facility Maps designed to keep drones, aircraft and other potential hazards out of one another’s way. LAANC was scheduled to be in operation in more than 300 air traffic control systems at more than 500 airports nationwide by the end of September. Its role is to act as a central point of contact and information for commercial drone operators, hobbyists, air traffic control, law enforcement and anyone else interested in drone traffic. 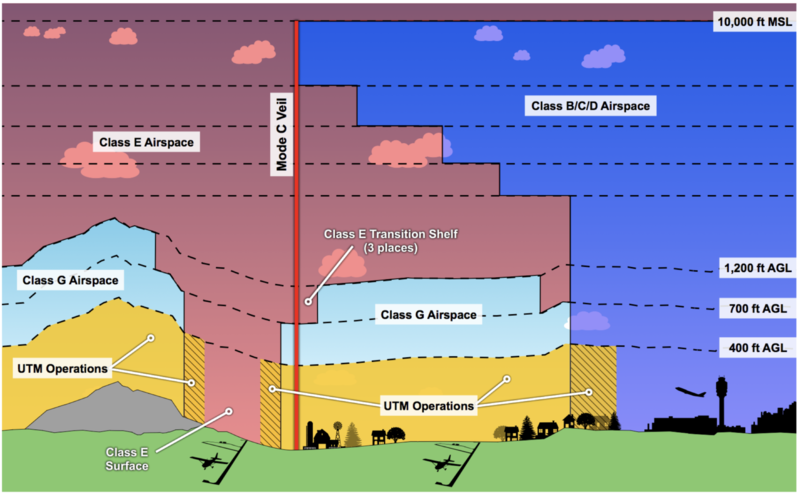 Like other FAA programs, the UTM divides territory into different classes of airspace, depending on height and proximity to other potential hazards, such as an airport. Traffic management has to be able to identify aircraft in each zone and communicate with or influence them to move in a direction that is safe for all aircraft. The idea is straightforward, but dozens of questions remain about how to set priorities on different types of traffic, and different types of aircraft, while making those evaluations and decisions resulting from those priorities obvious to UTM operators, according to NASA. The UTM, and the more recent lobbying of drone user consortia to encourage collaboration, represent a big change in position and in attitude toward drones at the FAA. It is less clear how much of that switch had to do with a change of personalities in management—former Administrator Michael Huerta stepped down when his five-year term ended in January, Deputy Administrator Daniel K. Elwell stepped in as Acting Administrator. It also could have something to do with the realization that the problem was a lot bigger than the FAA thought it was going to be. If the UTM works as planned, however, it will allow the FAA to reduce or remove restrictions on things the FAA has always forbidden for safety reasons—flying a drone beyond the point the pilot can see it, for example, flying it over people, flying at night, or flying with payloads to be delivered. The FAA has another year to finalize rules that might allow Amazon or other service providers to develop and fly delivery drones. • The qualifications, if any, a service provider would need to operate a UTM. Even for tech providers who don’t compete in the market for the drones themselves, the ongoing cost of traffic management could be worthwhile market, according to a report from UAV-business analysis firm Unmanned Airspace. Spending on the startup version of the UTM will be “modest to say the least,” according to the report, which goes on to estimate that traffic management services for drones will be worth $517 million between 2018 and 2022. Minneapolis-based venture capital firm LoupVentures, however, predicts UTM service providers will have to charge drone operators a fee of between $100 and $300 per aircraft per year starting in about 2020, when there will be about 414,000 commercial drones flying in the U.S. By 2030, the firm predicted, there will be as many as 10.8 million drones using the national airspace compared to about 280,000 manned aircraft flying regularly. The FAA hasn’t decided which of several drone ID schemes to use. It may use the Remote ID specification it announced in 2016, or integrate that with with Open Drone ID from Intel, or add some integration with DJI’s “license plate” called Voluntary Flight Identification Option, which integrates with its Aeroscope geofencing capability. “Remote ID isn’t the only thing needed to make drones more secure, but it is a necessary aspect,” according to Lisa Ellman, an attorney with the Washington Law firm Hogan Lovells who is also co-executive director of the Commercial Drone Alliance, which is campaigning to get the FAA’s hobbyist-friendly Section 336 repealed. “At the simplest level if you see a drone flying where it shouldn’t, or doing something it shouldn’t, how do you know whose it is? Is it a careless citizen, or a criminal? It’s important to the future of innovation for all the drones to be identifiable without a burdensome requirement,” Ellman said. That’s why people were watching the FAA bill so closely to see the issue was resolved before the bill was signed. Having a defined set of rules—or mostly defined—will be a huge step up for people interested in commercial drone services, according to Colin Snow, CEO and founder of Skylogic Research LLC, which conducts a large-scale survey of drone users in an effort to gauge the size and composition of the commercial drone market, and its major concerns for the year. Until the reauthorization bill passed, one of the biggest concerns focused on the glacial speed of change at the FAA and the real chance that the agency might reverse itself on a critical decision and kill a nascent commercial service in the process. “Every industry is perplexed about the consistency of regulation and enforcement,” Snow said. “This a big reason there is a lot of caution about commercial services. How much potential do drones have for economic benefit? That depends on business investment, and I don’t know how much businesses want to invest in drones. For lots of reasons they’re still trying to figure out how to adopt them and use the data,” Snow said. “The FAA put out statements saying they’re all in favor of states putting regulations on drones, because some of them are also a local issue,” Snow said. “In Newton, MA there’s a case where they put a restriction on drones flying below 200 feet; well, that’s illegal. The FAA has regulatory power over the airspace, but it does nothing to enforce it. So, does Newton own the airspace from 200 to 400 feet, and the FAA gets what’s above that? “On the commercial side, the growth isn’t where everyone thinks it should be, mainly because of the regulatory issues,” according to Michael Blades, an experienced military pilot, expert on drone use and technology and research director, Aerospace, Defense & Security North America for Frost & Sullivan. “Drones are cheap and easy to fly, that makes them much more attainable for the average person at Best Buy. The drone market offers a lot of opportunity and drone businesses are already flourishing. 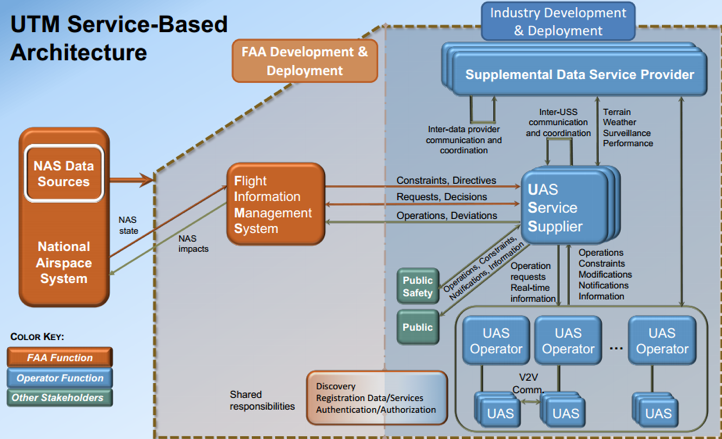 Can the FAA’s system handle the amount of data and traffic? Concerns about security are likely to go beyond the FAA’s concern that a drone will fall on someone. Amazon Prime Air may not be able to deliver in the U.S. yet, but Amazon did pick up a patent in 2016 on a method to prevent hostile takeover of drone in flight during package delivery. Delivery drones don’t create or pose as great a risk as the (allegedly) CIA-controlled RQ-170 Stealth drone that crashed 140 miles inside Iran in 2011, and which the Iranian military claims to have reverse-engineered to produce its own stealth drone. But every company has its secrets, so it’s better to make sure there is good enough encryption, tamper-proofing and physical security to keep anyone who captures delivery drone from getting to the PKI certificates customer locations and credit-card numbers or other sensitive information, according to Richard Newell, senior principal product architect at Microchip Technology (formerly MicroSemi). “You want to be sure it’s no good to them even if they bring it back to the lab,” he said.